The location had special significance. The center is located in what was one of the buildings of St. Peter the Apostle School, and St. John Neumann, as Bishop of Philadelphia, is credited more than any other with firmly establishing Catholic schools in parishes throughout his diocese, and he had a special fondness for St. Peter Parish. His idea was not just learning the faith but sharing the faith; not just by word but by action, and that’s what Catholic Schools Week (Jan. 27-Feb. 2) is all about. 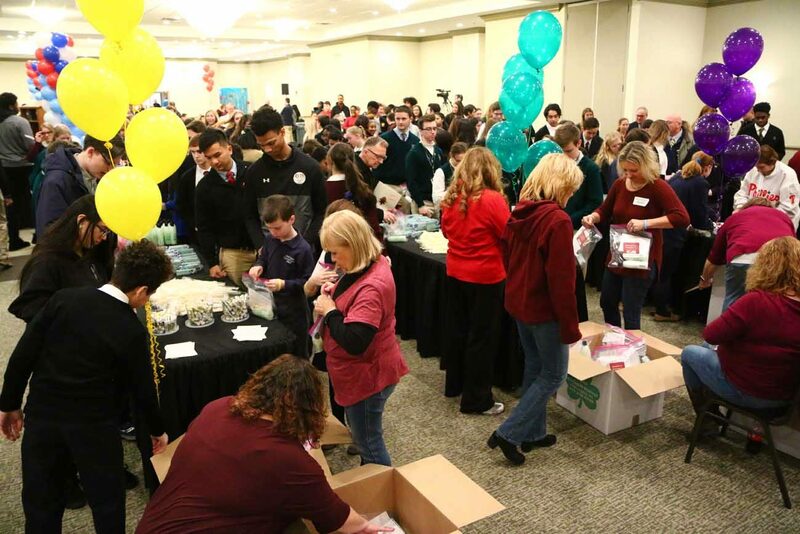 Over the course of the day young people combined to package 3,000 bags with personal items to benefit individuals served by Catholic Housing and Community Services (CHCS). As a division of the archdiocesan Secretariat of Catholic Human Services, CHCS serves older adults through programs running throughout the Philadelphia region. Presiding over the event was Bishop Michael Fitzgerald, who oversees Catholic education in the archdiocese. In his view, the event relates to something Pope Francis talks about all the time. One of those young people was Abigail Golemboski, a senior at Pope John Paul II High School in Royersford. This was her third time coming to the annual event. Hers is just one of the growing number of parish-based and community-based programs for seniors throughout the archdiocese. The whole event was part of Catholic identity, bringing together Catholic Social Services and Catholic education, according to John Wagner, deputy secretary for Catholic Human Services and CEO of CHCS. But while charity begins at home, it doesn’t end there. At this event another group was making rosaries for the Pontifical Mission Society, which spreads the Good News and performs both charitable and spiritual works in 120 countries around the world. Whether at home or abroad, Catholic education plays a vital role in the mission of the church. I have developed and directed the Saint Monica Eldercare Program since 2003. It truly was a wonderful event and I was proud to participate.